The United Cement Company of Nigeria (Ltd), UNICEM, successfully commissioned their new cement plant 2 at Mfamosing, in Cross River State, Nigeria. 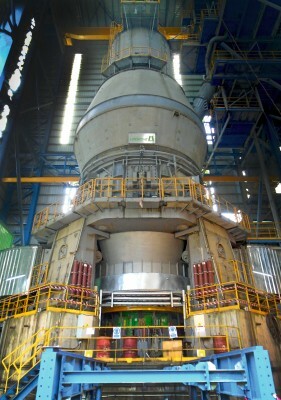 LOESCHE received the order for two vertical roller mills of the types LM 60.4 for grinding cement raw material and LM 70.4+4 CS, the biggest LOESCHE VRM for grinding cement clinker. Mfamosing – The cement plant at Mfamosing, located thirty kilometers north-east of Calabar, capital of Cross River State, Nigeria, is fully operational since February 2009 and equipped with the latest technology. With a capacity of 2.5 million tons cement per year the UNICEM plant has now been extended by LOESCHE technology. The customer ordered two vertical roller mills. One of the type LM 60.4 for the grinding of cement raw material with a product rate of 500 t/h. 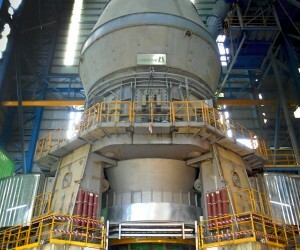 Cement clinker will be ground with the brand-new highlight, the LOESCHE mill type LM 70.4+4 CS. This mill is designed for a capacity of more than 370 t/h. In combination with this enormous capacity a new drive system for an operation power up to 8,800 kW is necessary. In a close cooperation between RENK AG Augsburg and LOESCHE GmbH Düsseldorf this development was established. Input from the end-user LafargeHolcim, as well as from a renowned technical university in Germany, was taken into consideration. The utmost important difference of this development is the fact that long stand-stills of a mill (for several months) due to the repair of any of the conventional gearboxes will be a matter of the past. Implementing the COPE drive requires the standard foundation. The replacement of one of the 8 small size motors will be easily conducted as they are readily available and easy to install.